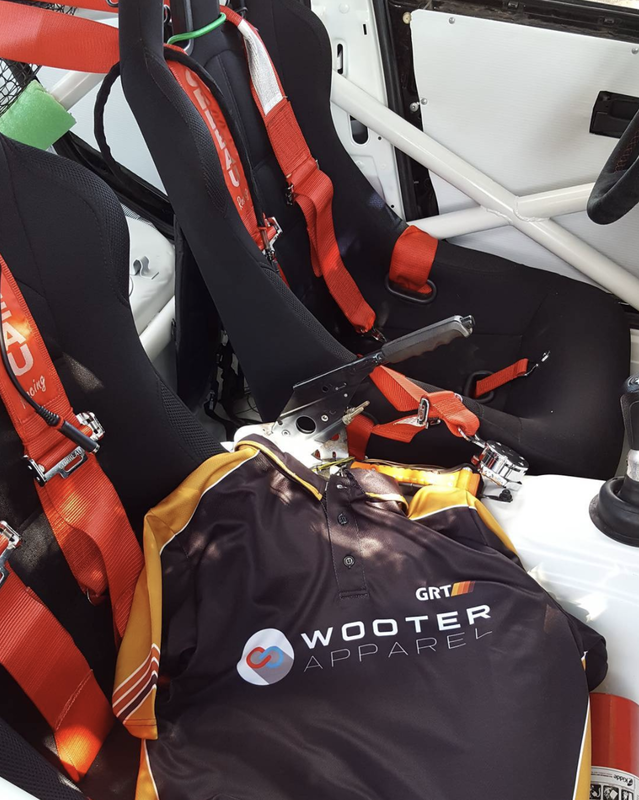 Along with being a featured sponsor, Wooter Apparel presented owner and driver Garrett Griffith and his Griffith Rally Team (GRT) with customized polo shirts, as GRT recently competed in the 100 Acre Wood Rally car race in Missouri. 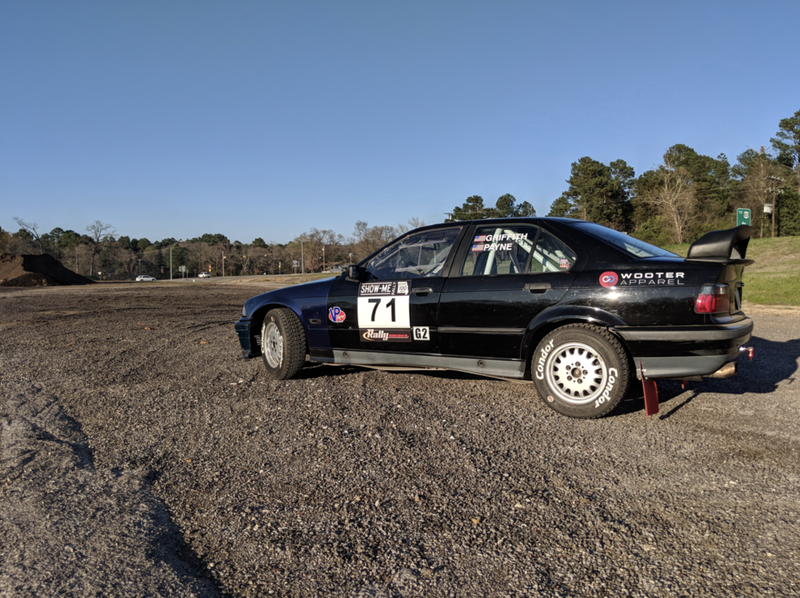 Just when you thought Wooter Apparel was only meant for the court or field, along comes rally car racing to speed things up in a new direction. Since launching in 2014, Wooter has teamed-up with sports teams, leagues, schools, and organizations to help build relationships and sponsorship opportunities. Now you can officially add car racing to that list of those who proudly sport Wooter. Before we get into how you came to team-up with Wooter as a sponsor, can you share some about your background in racing? My background in racing is very shallow. Apart from last year, I had not partaken in any motorsport event. I found out about rally through video games and YouTube videos. I got hooked instantly. I thought to myself, I want to do this…I will find a way. At the time, I was still in college (University of Texas at Dallas), and it just so happened a rally took place on one of the weekends of spring break. It was the 2016 Rally in the 100 Acre Wood. The 100aw rally is the closest event from where I live (Texas), it is still a 10 hour drive. This was my first time seeing rally cars in real life, and I was like a kid in a candy store seeing all the entrants. I soaked up that entire weekend, and told myself, I would be back next year with a car to race…and so the adventure began. How long have you known Carl Payne and when did you guys decide to start racing together? Carl and I have known each other for a little over a year. When my first event was approaching (2017 100 aw), I was in need of a co-driver for the event and knew nobody. I found a few folks who where involved in rally around Texas, and they led me to Carl. I reached out and explained I was preparing for my first rally and needed a co-driver, surprisingly, he said yes. Looking back, this was a big risk he took. He agreed to ride shot gun with a new driver about to hurl a car in the woods. He was a huge help and really guided me on how the event works. He explained the flow of the rally and how to prepare accordingly. From the court, to the field, and now to the race track, Wooter Apparel continues to explore opportunities to partner with teams, leagues, and organizations for a sponsor. Some people may think this is just another car race -- what sets Rally car competition apart from the rest? Rally is unlike any other motorsport, because it is the rawest form there is. Take a car, go from point A to point B as fast as possible, no matter the roads or condition. In North America, the roads are all gravel, meaning normal production cars are outfitted to withstand rough terrain at very high speeds. These roads are typically found in forest, and in the middle of nowhere. Rally is not a very spectator friendly sport because of it, so many are not given that change to fall in love. Those who do attend an event, walk away hooked, and for good reason. A rally takes a lot of planning and concentration, not only from the driver, but more importantly…the co-driver and crew. You can't have one without the others, and you need all to function for the car to reach the end successfully. What is the preparation and race day like for you? Preparation is key and takes lots of my personal time to do so. Because I own the car and manage the team, lots of evenings are spent planning and making sure everything is ready to go. Due to the very unpredictable nature of rally, it's almost impossible to expect the unexpected. So you prepare the best you can, and hope it is enough to overcome any obstacles in which might be thrown your way. Before each rally, I make sure the car is back to 100% health, and is ready to take the intense beating for the rally. What do you love the most about racing your #71 e36BMW? 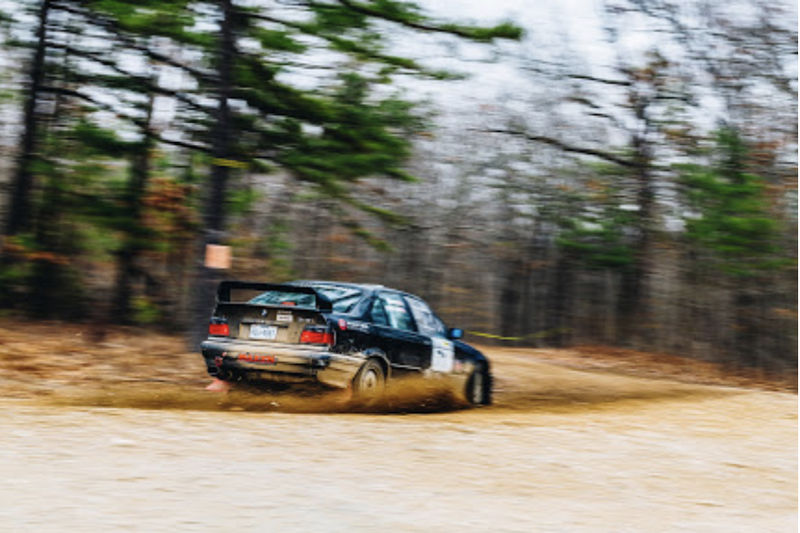 The 1995 BMW 318i 4 cylinder is my first rally car, what is not to love about it? Truth be told, when I first got into rally, I had no idea what I was doing. I got onto CraigsList and searched for cheap cars, without any regard to what would be best on stages…simply because I didn’t know any better. I found this BMW for $600, non-running, and committed to it. I would say I love that I built the car, and didn’t buy it already built. This has given me a huge sense of accomplishment, but also allows me to be familiar with the car when unfortunate events occur. Being that it’s a BMW, and rear wheel drive, the driving style is a bit flamboyant. Although it is super fun to slide around a turn and feels amazing when executed correctly, it is generally a slower platform. Front wheel drive and all wheel drive vehicle are generally faster as they have more precision throughout the turns and slide less. How did the relationship with Wooter Apparel develop as a sponsor? Wooter initially sent my former college, University of Texas at Dallas, opportunities for athletic sponsorship opportunities. I was the president of the paintball club, so I suppose that’s how I got the email. I replied back saying the club was diminishing, but I was starting a rally team. I gave a bit of information about rally and GRT’s future goals, then Wooter sent custom polos to us. This was important because it really gave GRT an image, and helps instill a foothold for Wooter Apparel in the rally universe. 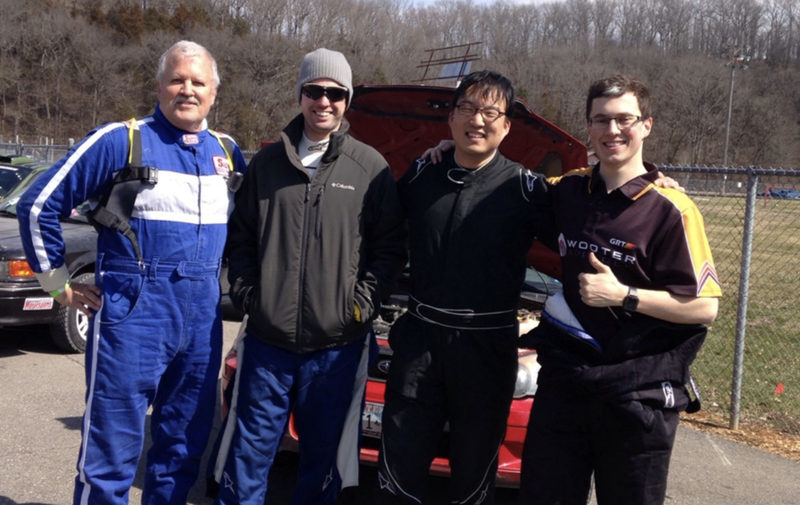 What does it mean to team-up with a global brand like Wooter for your rally team? Having Wooter Apparel as a sponsor is fantastic, as it gives each person on the team a sense of being part of the family. It's very easy to spot member of GRT during an event, with the custom polos. I would love to start an apparel line and start getting spectators to represent GRT and Wooter Apparel colors in the woods. Wooter Apparel makes great products, and I am trying to show the rally community just that. You and Carl recently competed in the 100 Acre Wood race in Missouri. Looking back now, what was that experience like? The previous rally was very satisfying, and left all of us wanting more. Although we experienced many mechanical failures, we were able to overcome these challenges and ‘Press On Regardless’. No team ever wants problems, but facing these hurdles and overcoming them to complete a rally is a very surreal feeling. Carl and I were meshing very well together near the last few stages. His notes were almost perfectly timed to my liking. I was braking later, and taking corners faster, without ever really risking the car. We ran all of day 2 with ¾ the power, and still out performed full functioning cars. Its taking what you have, making the most of it, and see potential that has got all of us itching for more. What races do you have coming up where people can follow along this season? As GRT starts repairs, the next events are being planned. A few scheduling conflicts have prevented the originally sought after events from happening, so now new plans are being formed. We have our sights on 1 national level event and 1 regional level event to finish out 2019. -Ojibwe Forest Rally in Minnesota. The time between events will allow the car to get a few upgrades in reliability, as well as, performance.